Updated: You can buy the book here. Three years ago, this “Penniman Project” started when David Spriggs, Mark Hardin and I tried to figure out the origins of 17 little bungalows on Ethel Avenue in Norfolk, Virginia. In my last blog, I talked about the fact that we now have some answers. We learned that the “Ethels” (plus another two dozen houses on Major Avenue and Glenroie Avenue) came from Penniman, DuPont’s 37th munitions plant, built on the shores of the York River, east of Williamsburg. Finding information about Penniman in contemporary literature has been difficult. In fact, most of our information has come from two sources: The Virginia Gazette (a weekly Williamsburg paper) and the Hagley Museum and Library (in Wilmington, Delaware). At its peak, the village of Penniman had a population of 15,000. 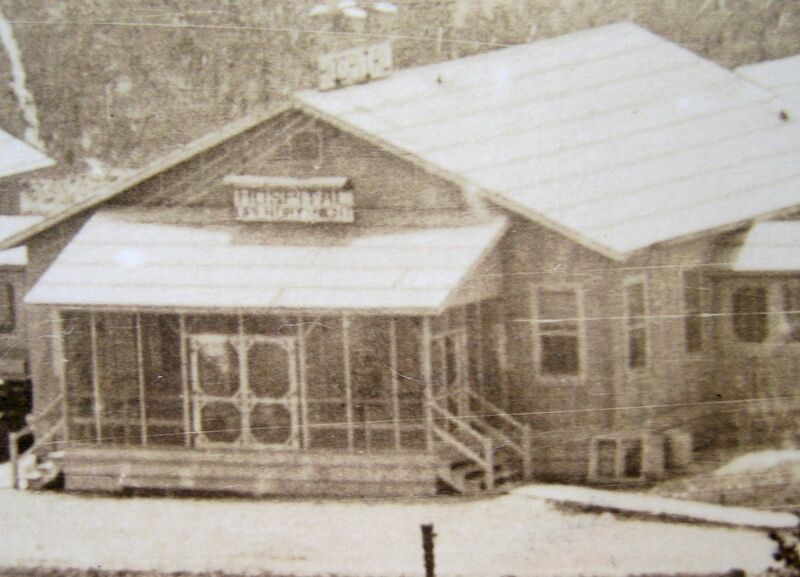 In 1918, the War to End All Wars ended, and Penniman became Virginia’s very own ghost town. The newly built houses at Penniman were sold off whole (and some were shipped by barge to Norfolk) and they were also sold in pieces, as salvage. A hotel from Penniman ended up on the William and Mary campus, along with several houses. Because of the Spanish Flu, public gatherings became illegal, schools were closed to children and re-opened as hospitals, and public funerals were outlawed. On October 8, 1918, The Daily Press reported 5,000 cases of influenza in Newport News. “To show the terrific pressure under which a handful of doctors here are working, one physician yesterday is said to have had 500 calls,” reports The Daily Press (October 8, 1918). 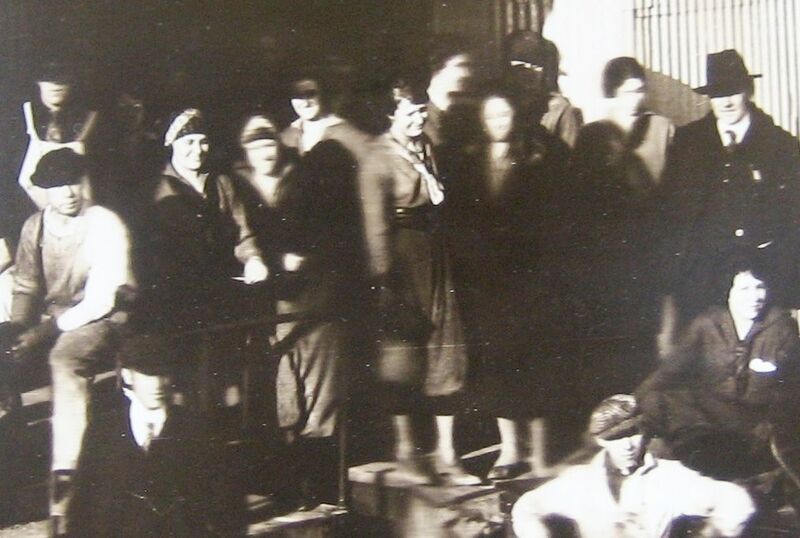 On October 9, 1918, children were told to go to their school and pick up all their belongings so that the schools could be converted into hospitals. And it was also on the 9th of October that a large headline announced, “No More Public Funerals Allowed” (The Daily Press). In the same story, people were advised to wear a gauze mask over the face when they ventured outside. The next day, another article reported that “nearly every home [in Newport News has been] affected by the disease” (The Daily Press, October 10, 1918). It was unlike anything we can imagine today. In the midst of this, a small graveyard was opened up on Horatio Bucktrout’s farm for the paupers of Penniman. Its location is, as Terry Meyers described, “South of present-day Newport Avenue and east of Griffin Avenue,” or about three blocks from William and Mary College. November 6th, I drove out to Williamsburg determined to see the Bucktrout Cemetery with my own eyes. And I was successful. There are no markers, and there are no remnants of markers and there are no depressions in the ground suggesting an old grave site. In fact, there is no evidence that two dozen people were laid to rest in Bucktrout Cemetery. A local resident was kind enough to show me a place in his backyard where three graves were known to exist. In 1979, a new housing development was built on Counselor’s Way, and it’s possible that the new development was built over the unmarked and forgotten Bucktrout Cemetery. But according to Mr. Meyer’s article, no graves were discovered during the construction process. 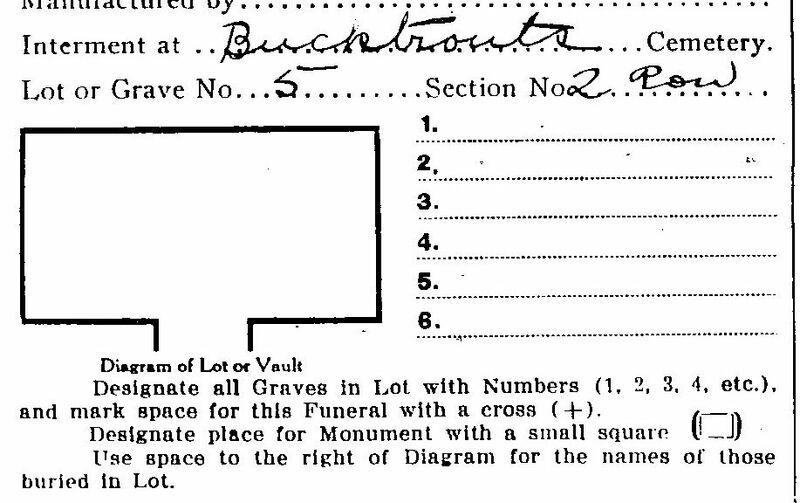 The funeral records from Bucktrout Funeral Home show that 25 bodies were laid to rest at Bucktrout Cemetery. In “Silence of the Graves,” Terry points out that there are another 13 Penniman influenza victims who may have landed in that cemetery, which would bring the total number of bodies to 38. There were five babies laid to rest at Bucktrout. John Steinruck’s baby was 10 months old. The other four babies were less than five days old. “Peachy” Cooke’s son James was only nine years old. As a historian, I understand that there are lots of unmarked and forgotten graves in our historic Commonwealth, but somehow, Bucktrout feels different to me. For one, the location may be lost, but there is a written record that 25+ bodies were placed into coffins and lowered into the ground, having been lovingly and tenderly prepared for burial by a local funeral home. With few exceptions, each burial record gives a row and grave number within the newly created cemetery plot. 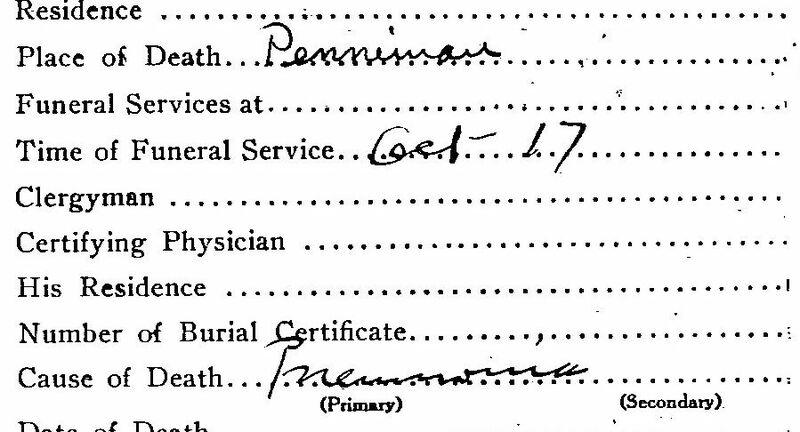 Secondly, from my reading of these burial records, these were the poor people of Penniman. While most burial permits record the closest of kin, birth dates, place of birth and more, the burial records for the men and women of Bucktrout Cemetery were hauntingly sparse. One burial record shows only a first name (Roger), with an “estimated age” of 25. Third, I’m both enchanted and captivated by the story of Penniman, and this is part of Penniman’s story, and part of Virginia’s history and a keyhole peek at an international pandemic. Just as the country was ready to breathe a collective sigh of relief because The Great War was ending, The Spanish Flu blew through, killing 60 million people (about 5% of the world’s population). In life, the people laid to rest in Bucktrout Cemetery were forgotten, unattached, and desperately poor. They were outside of all the important circles of community and church and family and privilege and wealth. And now, in death, there is nothing to remember them by. Not even so much as a memorial plaque to mark the spot. My focus and goal for today is to finish writing the book, and share what I’ve learned about Penniman, but I hope and pray that at some point, when the manuscript is complete, we can put our heads and hearts together and figure out a respectful, proper way to memorialize Bucktrout Cemetery, a pauper’s cemetery, and a piece of history right in the heart of prestigious Williamsburg. To read “Silence of the Graves,” click here. Many thanks to Bucktrout Funeral Home (Williamsburg) for donating the old ledgers to Swem Library (W&M), and thanks to Swem Library for making them available to researchers. 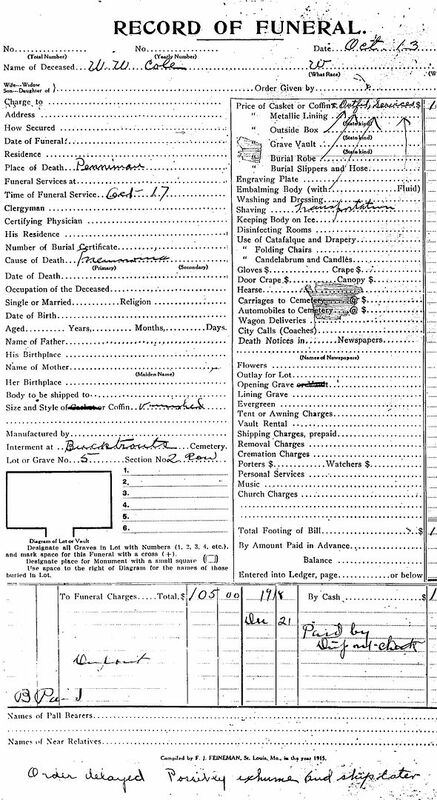 Typical "Funeral Record" for Bucktrout interment. Very little information is shown, and there's no next of kin, no age, etc. DuPont paid a death benefit of $105, which covered the cost of the service, preparation, coffin, plot and burial. Mr. Cole was laid to rest in a varnished coffin on October 17, 1918. With few exceptions, cause of death for most Penniman flu victims was listed as pneumonia. Technically, this would have been correct. According to DHHS National Institute of Health, the majority of deaths during the influenza pandemic of 1918-1919 were not caused by the influenza virus, but from the bacterial pneumonia that followed. People in Penniman and Williamsburg must have been frantic, and yet the funeral directors had the presence of mind to document the precise location of each grave for future generations. Corporation-bashing is a popular sport these days, but DuPont did right by their employees, in paying all funeral expenses. At the height of the Spanish Flu epidemic, DuPont paid out more than $9,000 in one two-month period for Penniman workers. In 1918, that was a significant sum of money. The site of the Bucktrout Cemetery is now a suburban backyard in the heart of Williamsburg. 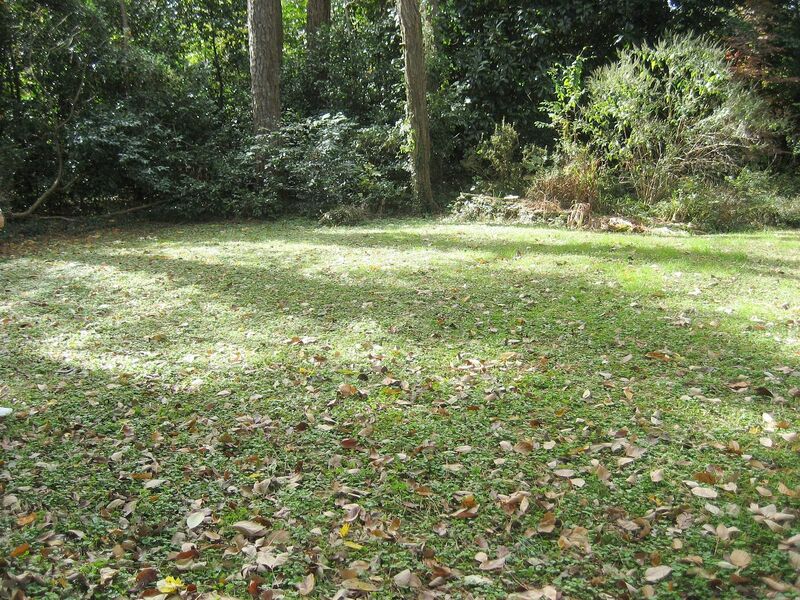 According to the home's owner, three rectangular depressions could be seen in the center of the yard decades earlier. In "Silence of the Graves," long-time residents of the area shared remembrances about other depressions in other yards that were so deep that the children had to "clamber in and out." In closing, here’s a list of the people buried in Bucktrout Cemetery. It’d be interesting to sketch out the plots, and figure out who’s buried where. 5) October 1918, James Arthur, Dupont employee, grave 8, first row. This is a shame, you would think the Township, County and State would want this area fenced off and marked as a cemetery. These people may have been poor, but they still need to be respected. As a resident of Williamsburg I can tell you it’s not that easy. Our township is littered with unmarked graves, and a dozen or so mass ones. If we fenced off every area that might, or is even known to, have a grave the town would have to be leveled and turned into one mass cemetery. There is also the fact that when the Rockefeller’s came through and rebuilt the town, much of it was down with little regard to what was there at the moment. People were bought out and houses were torn down or moved. 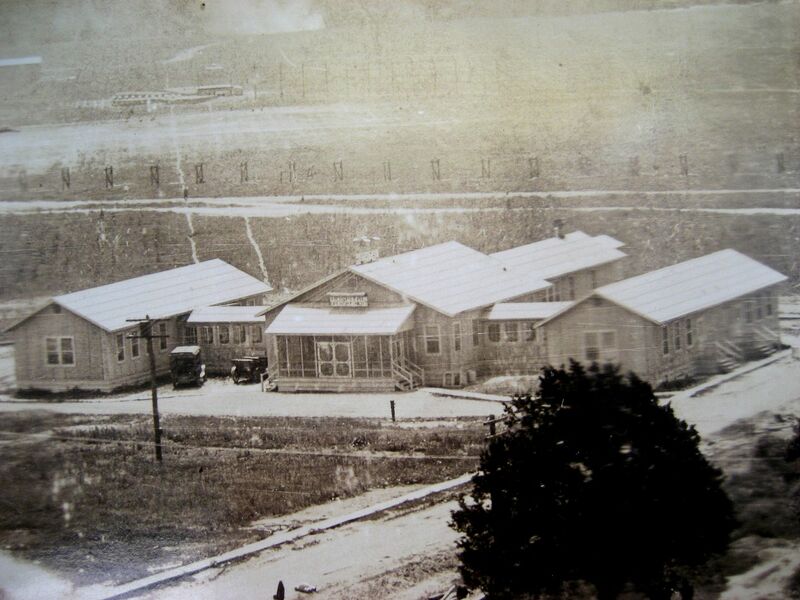 The town quite literally was leveled and refashioned in Rockefeller’s vision. Many small unmarked cemeteries were forgotten in the chaos. Sandston, Virginia: Another DuPont Town The Mystery of Our “Ethels” in Riverview is SOLVED! !